The cast and crew of Supernatural did a Christmas raffle this year. Below you can find some photos shared by some crew members, who asked not to repost the pictures. Jensen was photographed at Chateau Marmont hotel in West Hollywood on October 4th. Screenfad has published the stills of The Purge episode. Acording to Clif Kosterman, Jensen and he were playing golf yesterday, July 8th, and Jensen won! Besides, when a fan asked him about Jensen selling his house, he answered directly. 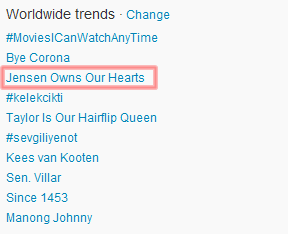 Jensen was on Trending Topics on twitter again because his fans, this time with Jensen Owns Our Hearts. It’s true, isn’t it? 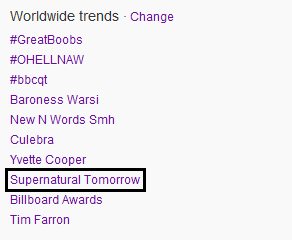 One day away from the release of Supernatural’s new episode, “On Grave Importance”, the fans gathered once again and made Supernatural Tomorrow a worldwide trending topic on Twitter. 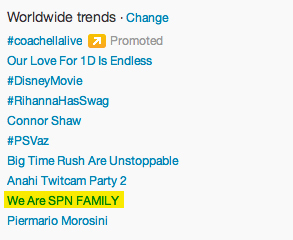 The Supernatural fans gathered and made We Are SPN FAMILY a worldwide trending topic on Twitter. 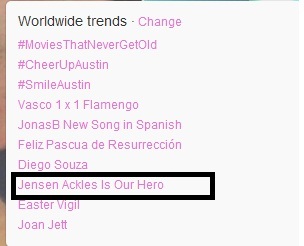 After trying for a long time, yesterday Jensen’s fans got Jensen Ackles is Our Hero as Trending Topic on Twitter.